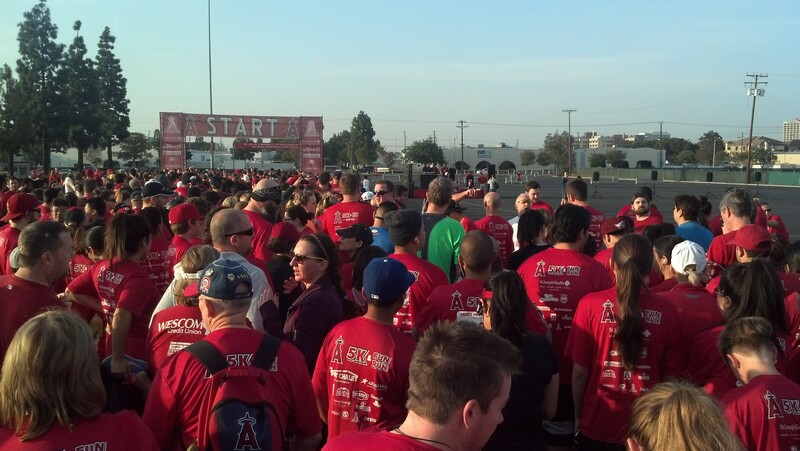 This past Saturday, I got to participate in the Angels Baseball Foundation 5K with my wife and a friend of ours. This was the third time I’ve run in this race. 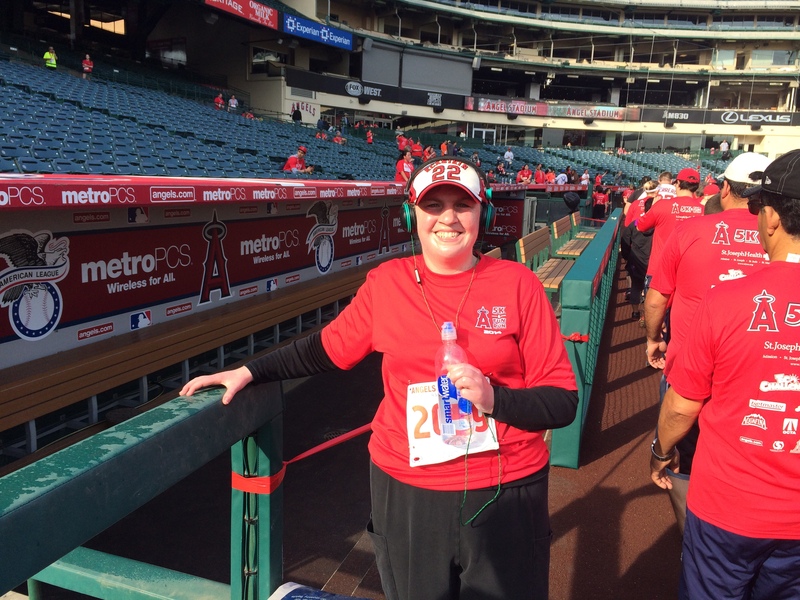 Last year, Brooke was supposed to run with me, but was not feeling well at all. So, I ran it solo. 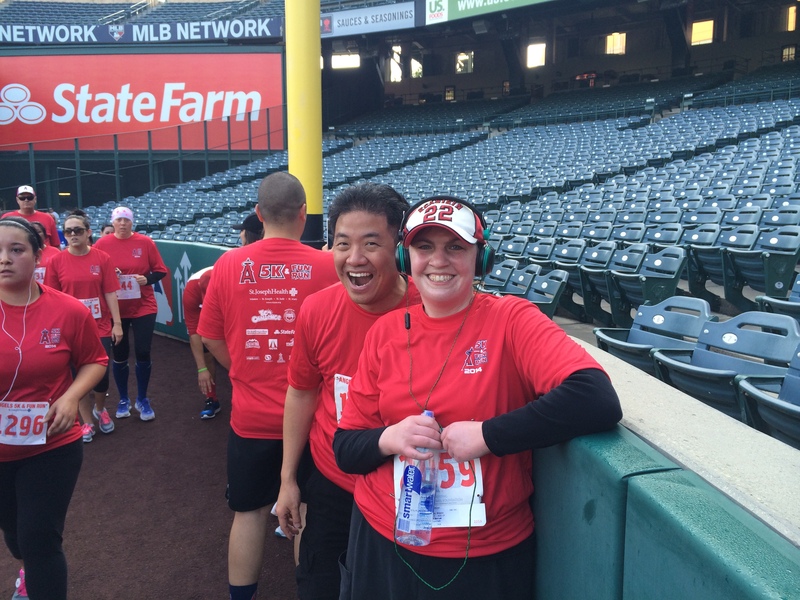 This year, it worked out for her to run with me and we even got one of our friends, Emmanuel, to join us. Such a fun day. Unlike many of the other races I’ve participated in, this race did not have a health Expo attached with it. There was a packet pick up on the day before (Friday) or you could just show up early on the morning of the race and get your race packet. 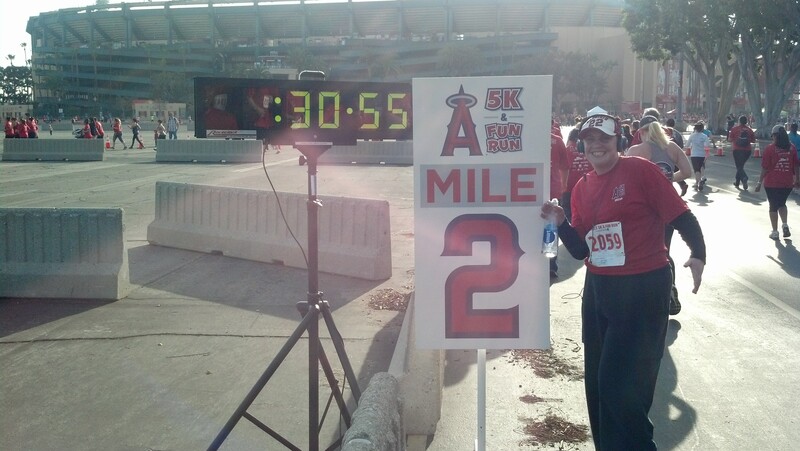 Two years ago, this race was on a Sunday and made it much easier to get there the day before. 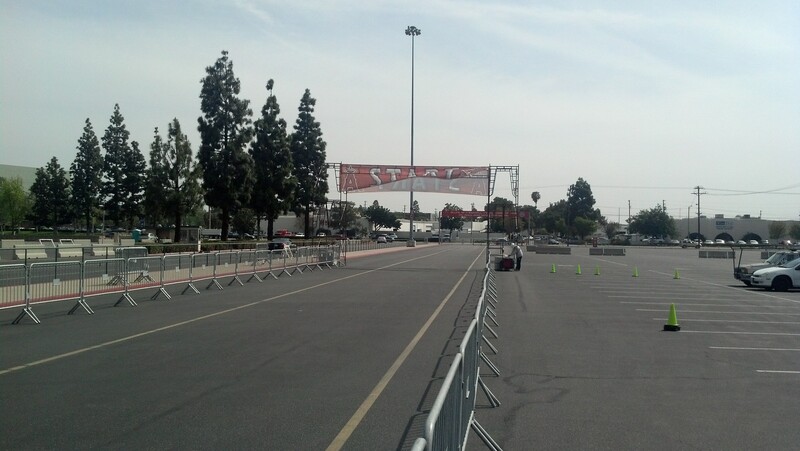 Last year, I opted to arrive early the day of to get my race packet and was not able to get a race shirt in my size. 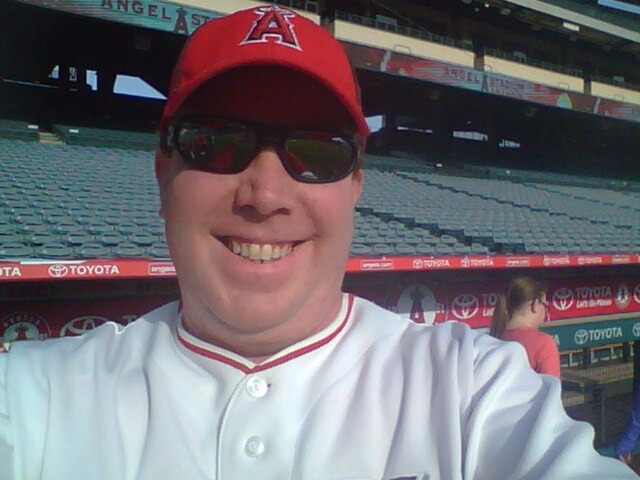 So, this year, I decided to take a half day of work on Friday and drive down to the stadium after lunch. So glad I did. 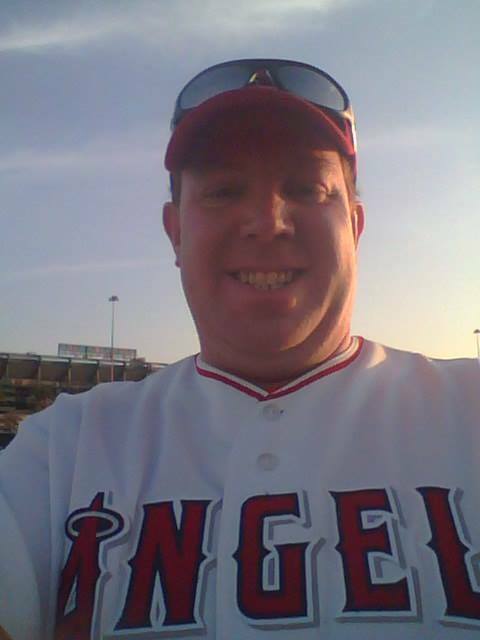 Angel Stadium is my absolute favorite baseball stadium. So, it’s always exciting to be there! 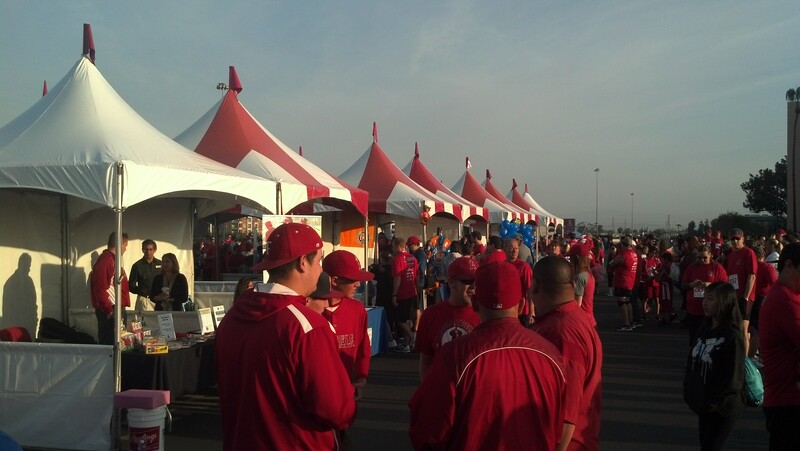 They had tents set up where you could get your race packets. As you can see, there were very few people when I arrived. So, that meant I got in and out of what I had to do rather quickly! I picked up my wife’s race packet and mine. Then, I roamed around the area for a bit. 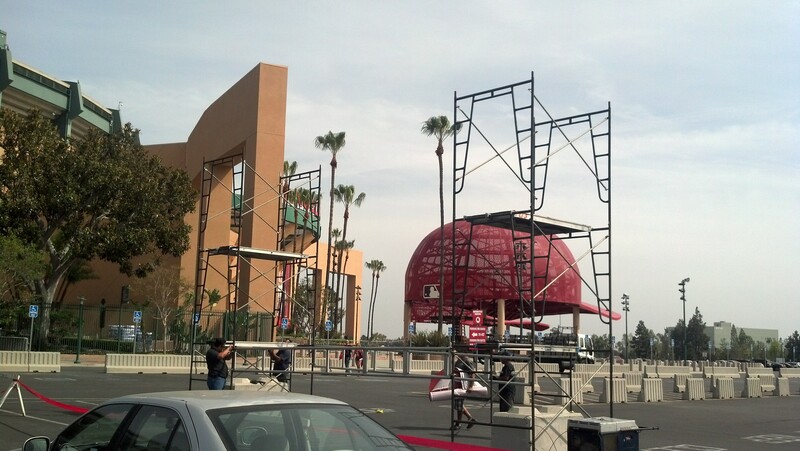 They were getting everything set up for the next morning. 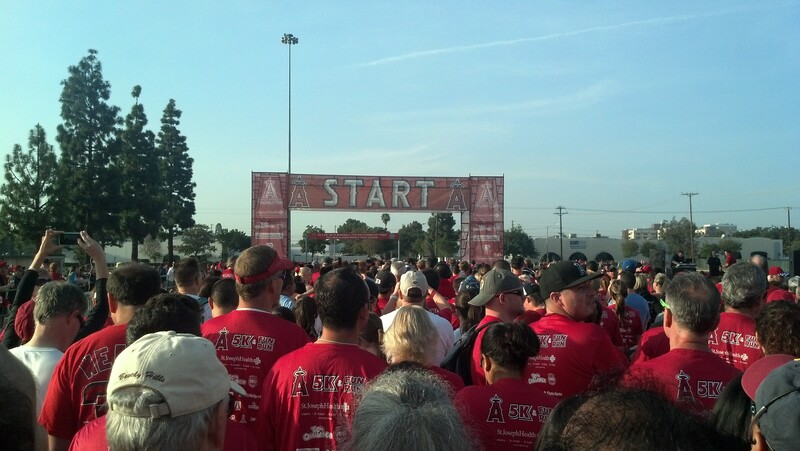 Here’s the start line. I ended up parking close to the finish line! 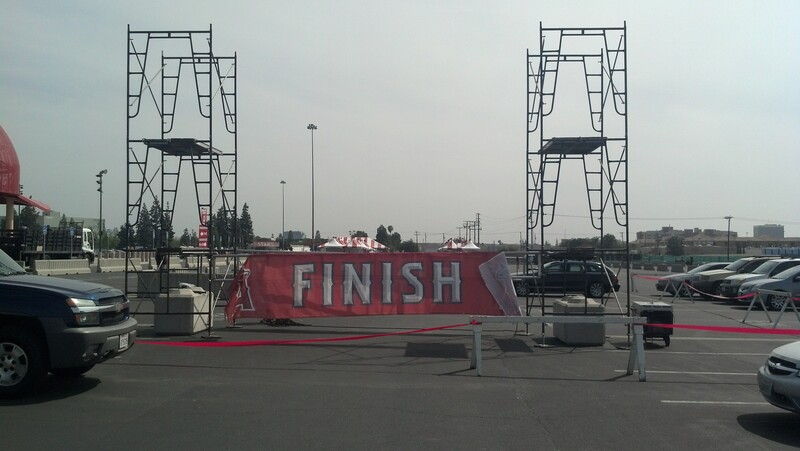 I was about to leave when I saw them getting ready to put up the finish banner. See? This is where we would finish the next day. 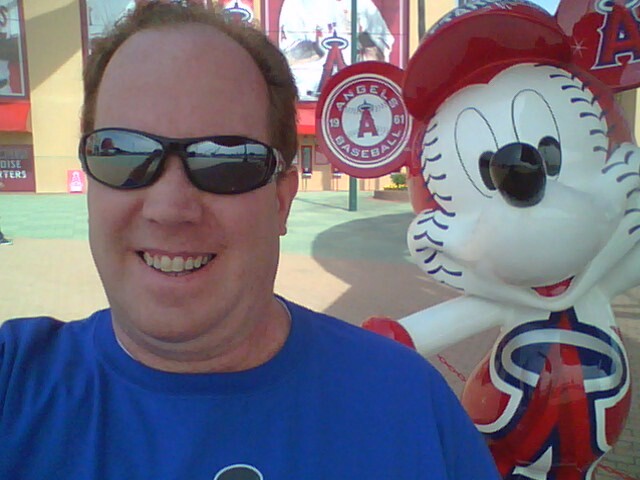 Also, what kind of Disney fan would I be if I didn’t visit Angels Mickey? With that, I was all set for the race. 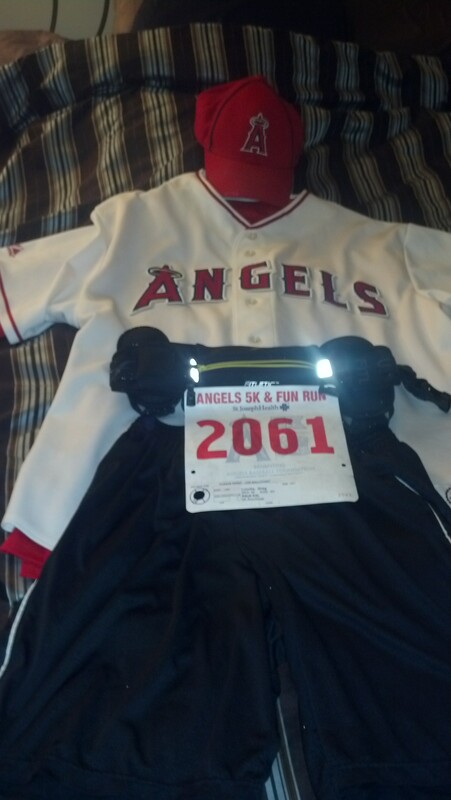 The night before the race, I laid out my race gear. Some folks would call this “flat Greg.” Once I got everything laid out for the next day, I got to get ready for bed. Then, at 9:10pm a 5.1 magnitude earthquake shook Southern California. Even though, we were a good distance away from the epicenter, our apartment shook pretty good. It was very loud. Well, nothing like an earthquake to destroy the best made plans. Instead of getting to sleep at 9:30pm, like planned, we probably didn’t get to sleep until closer to 10:30 or 11:00pm. It wasn’t awful. However, with a 5am wake up, it wasn’t ideal either. I was glad that I wasn’t running a half marathon the next day. Even though I didn’t get as much sleep as I would have liked, I crawled out of bed at 5am and was out the door just after 6am. We arrived at the stadium around 7am which gave us about an hour before the start. So, there was plenty of time to get our gear together and use a real bathroom before lining up. I went off to find something to tie our timing chip to our shoes with. The bummer was that there were no ties. So, I would have to put it in the laces of my shoe. As I walked back from the staging area, my friend Emmanuel texted me to let me know he was there. We met up and walked back to the car. 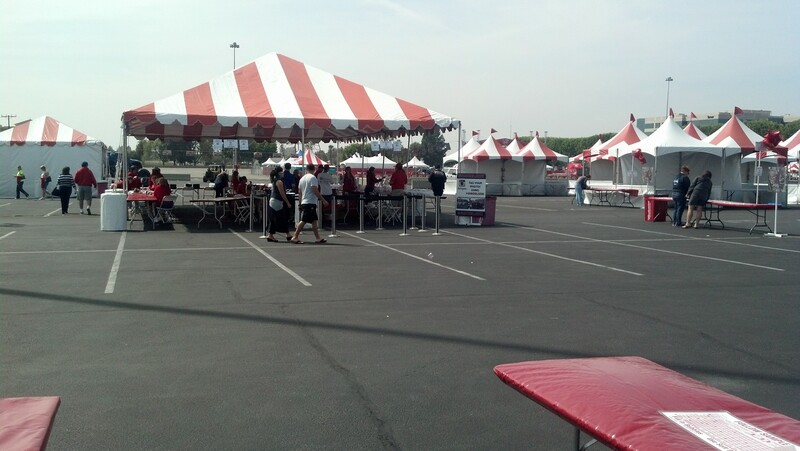 We walked around and checked out the booths that were set up. This isn’t exactly a health Expo. So, the vendors that were out were not typical. You had car insurance companies, the Angels had a few booths to promote various things. Dave n Busters was there. It was kind of bizarre. Of course, we had to do the group selfie while waiting. 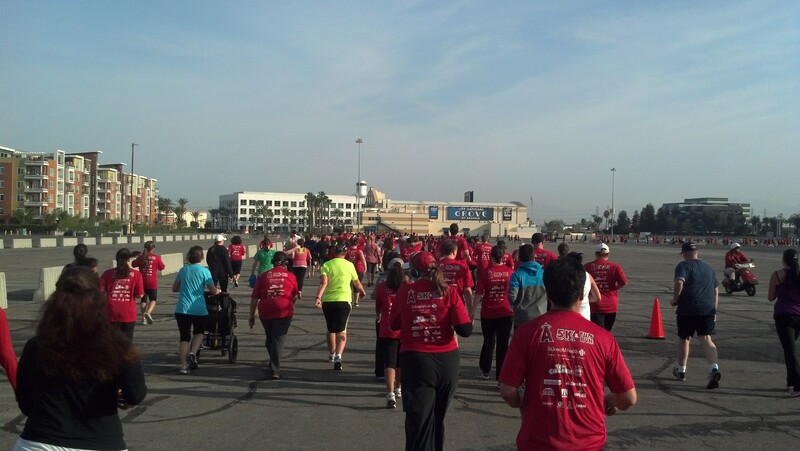 Close to 8am, the announcement was made for us to make our way into the starting corral. 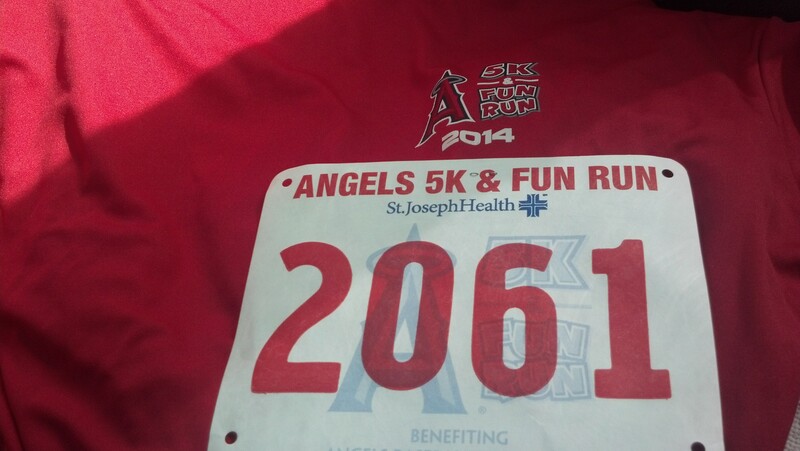 Much like other 5K races, there were no corral numbers or letters. We all went at once. As you can see, there was quite a good size crowd for the race! So much red! While we waited to go, Roger Lodge (who does an Angels radio show and was the MC for the event) had a special question from the Angels owner. 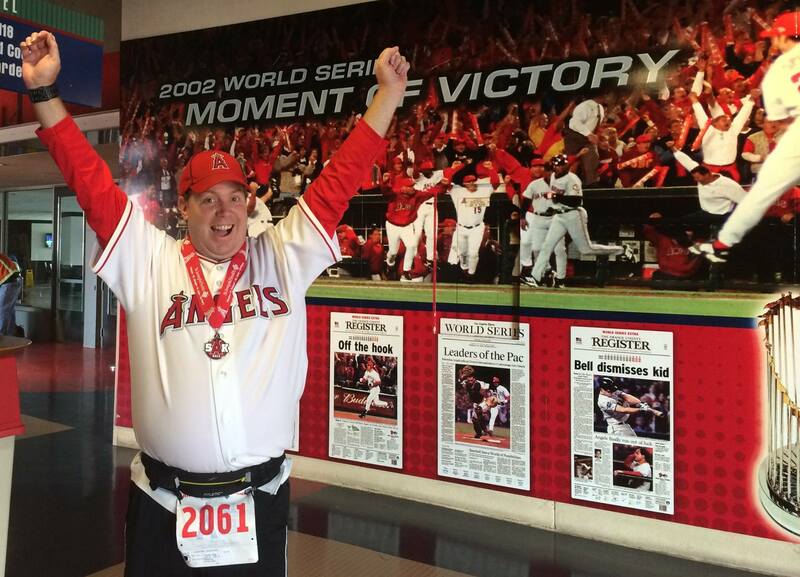 He asked if we were okay with the Angels signing Mike Trout for a contract that won’t expire until 2020. Of course, the crowd roared in approval. He said that he’d let the owner know it was okay to go forward with the planned press conference that afternoon to announce the contract. There was a local who sang the National Anthem. Before we knew it, the race started. 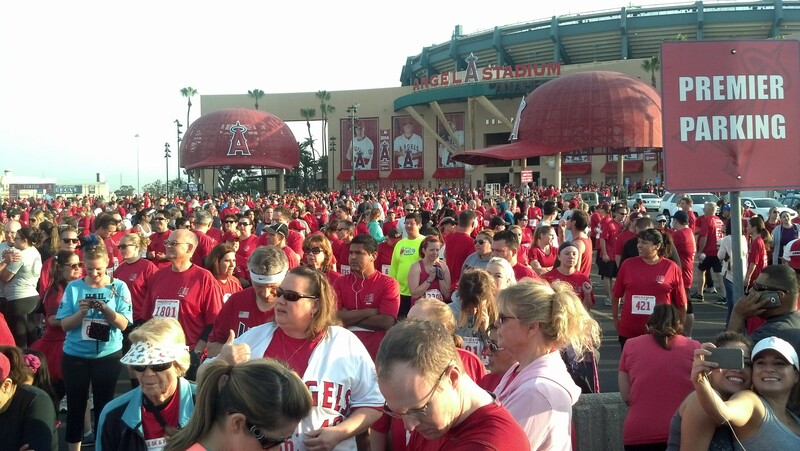 Usually, this race has around 4,000 people in it. Getting all of us through the starting gate can be crazy. However, my friend, Brooke and I stayed with each other through the madness. The great thing about this race is how quickly the course opens up. It’s crowded to get through the starting gate. Then, a few feet later, we’re running on a course that has 3 or 4 lanes. This is what the course looked like. We headed out the parking lot and made a right turn onto Orangethorpe Avenue. This route was different from the previous two years in that we next turned right onto State College Blvd. In previous years, we continued up on Orangethorpe until we got near the 5 freeway. I really liked the new course. There were two out and backs on this course. 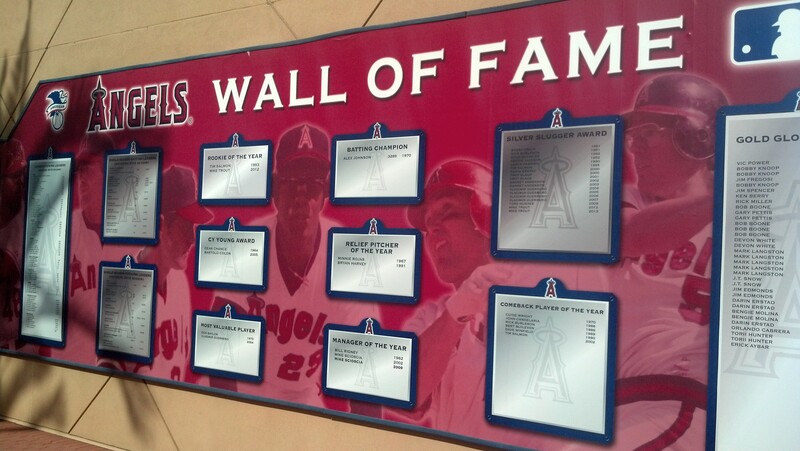 The first one went up Gene Autry Way. If you’ve raced the Disneyland Half Marathon, this is the road we take coming out of Angel Stadium on our way back to the Disneyland Resort. We would cross the first mile marker on our turning point before coming back on Gene Autry Way. I think we crossed the 1 mile marker somewhere around 13 minutes into the race. The second out and back happened when we got back to State College Blvd. We took State College to Katella and back into the parking lot. This is where the first water station was and the first band. I was really happy to see this upgrade from my previous two races here. In the last two years, there was no on course entertainment at all. And, they only had 1 water stop for the 5K. Not so this year. We would have 2 bands and 2 water stops! Not too far past the water stop, we came to the 2nd mile marker. The clock time is not our actual time. Brooke is always happy when we get to the next to last mile marker of a race. It means only a little more than a mile to go! 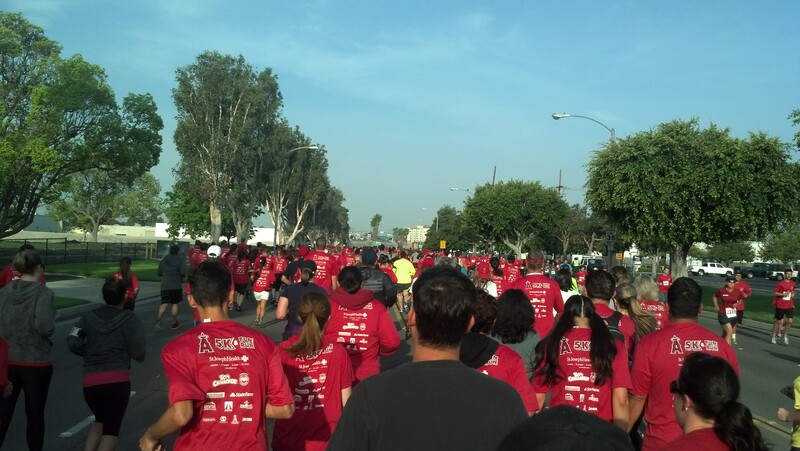 Just past the 2nd mile marker, we made a turn towards the Grove Theatre Anaheim. Fun fact…I used to work at this building back in 1999. Back then, when it opened, it was called Tinseltown Studios and was a themed dining attraction similar to Medieval Times. We wrapped around the parking lot and came across this guy. 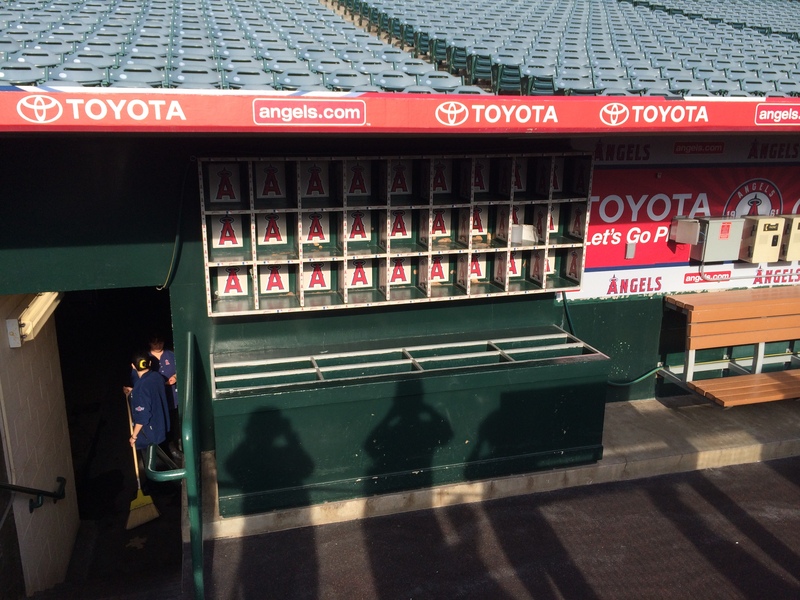 In another upgrade from the previous races, the Angels added 4 card board cutouts of players along the course to make for some picture opportunities. They even staffed all the locations with the Angels spirit squad. What a fantastic addition to the race! Since this was sort of unofficial Mike Trout day (and because Brooke and I are huge Mike Trout fans), we had to stop here. They had this cutout right about where the course came out of the stadium. 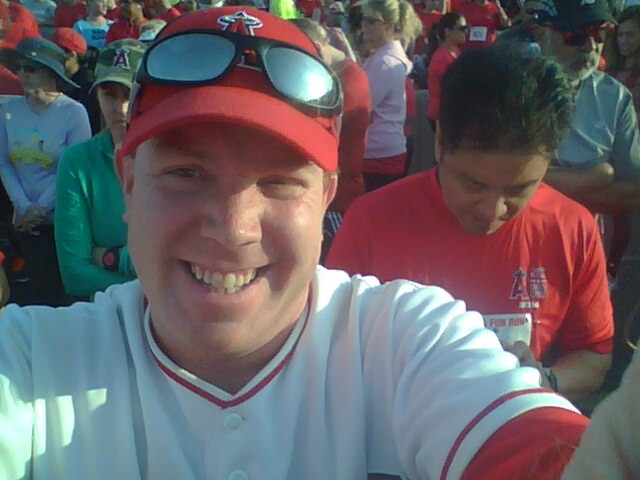 So, the people running behind us were almost finished. Not too far up the parking lot, we came to the second water station and turned towards the Big A in the parking lot. 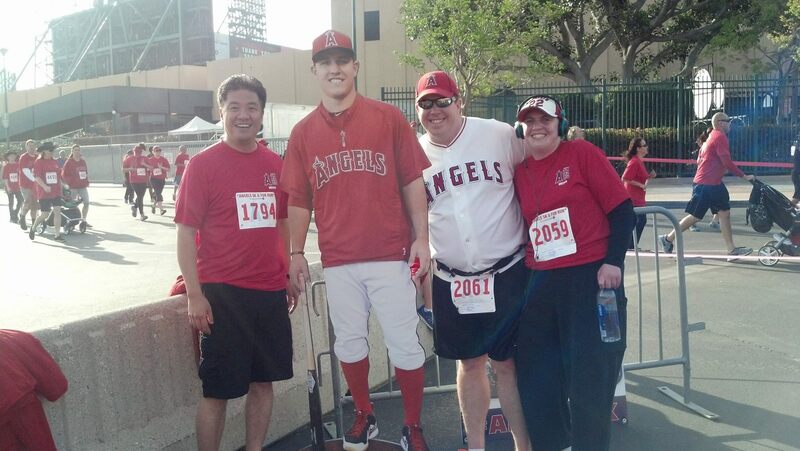 Although I didn’t stop for the picture, they also had a cutout of Jared Weaver, the Angels ace pitcher, right after the water stop. 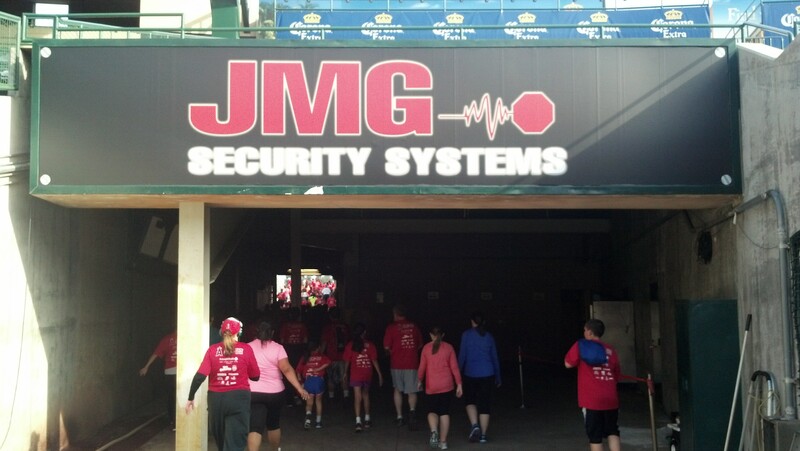 The course would end up making our way into the stadium next. 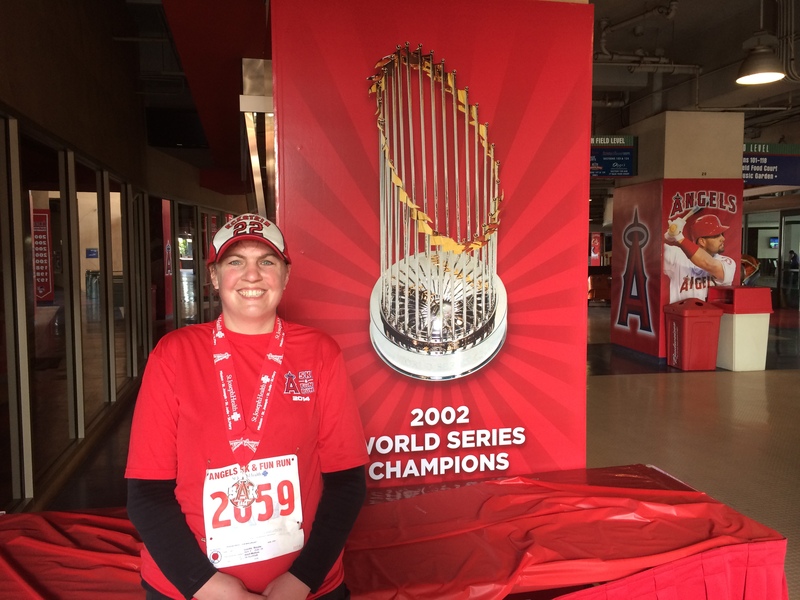 Those who have run the Disneyland Half Marathon should recognize this spot because we run the same ground in entering Angels Stadium. Of course, without the crowds of people lining the route, you might not. 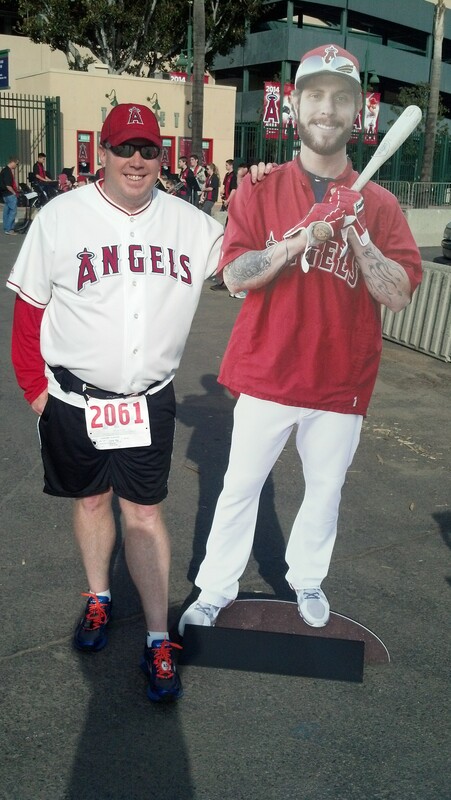 Just outside the stadium, they had this cutout of Josh Hamilton and across from him another cutout of Howie Kendrick. Brooke wanted to get inside the stadium. So, she didn’t bother to stop. 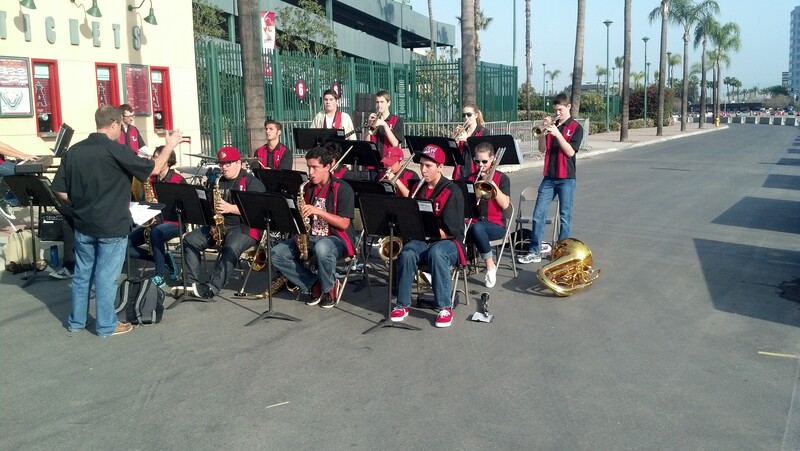 Right behind Josh Hamilton was the second band on the course. 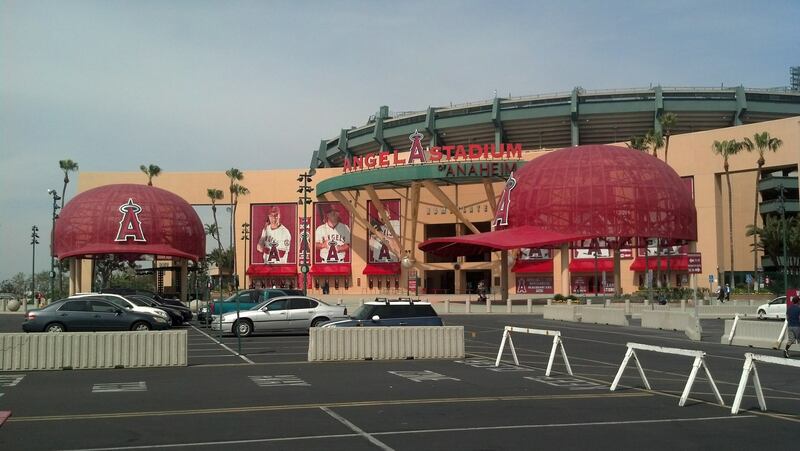 I must give props to the Angels organization for upping their game this year. It was great to have these additions! Of course, the highlight of this race is running on the field. 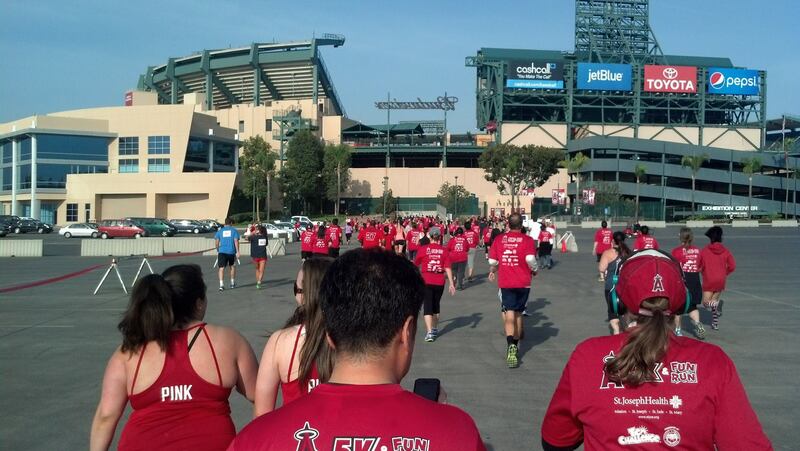 Even without the upgrades, this 5K is fun because you get to run on the field. Almost there! 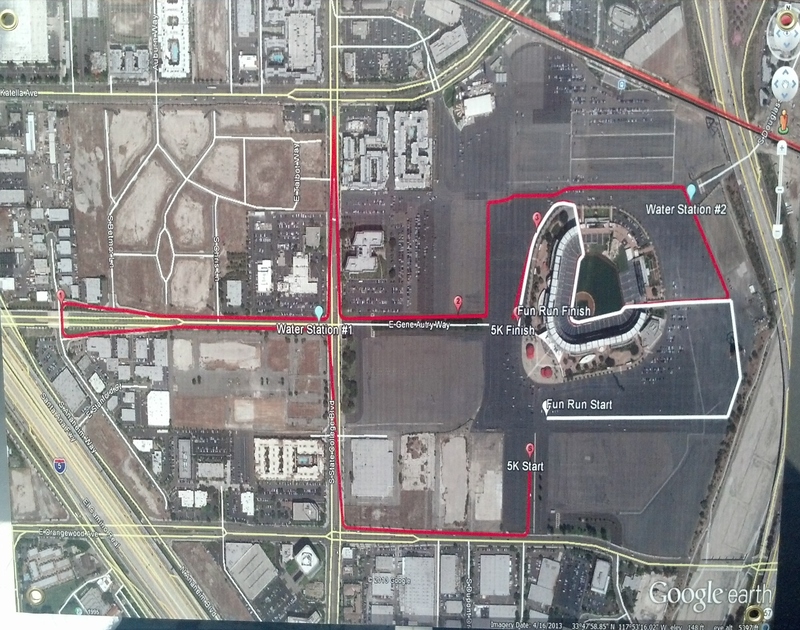 Running this race does make me appreciate all that runDisney does with this part of the Disneyland Half Marathon route. 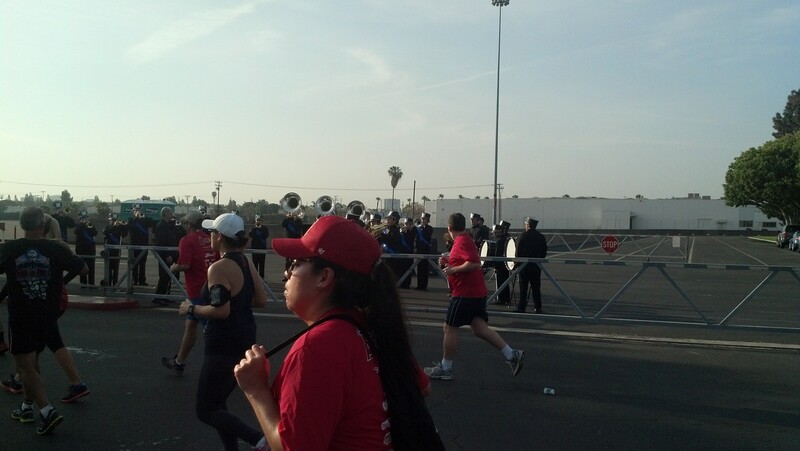 For the Disneyland Half Marathon, there were lots of people in the stands cheering us on. For this race…not so much. 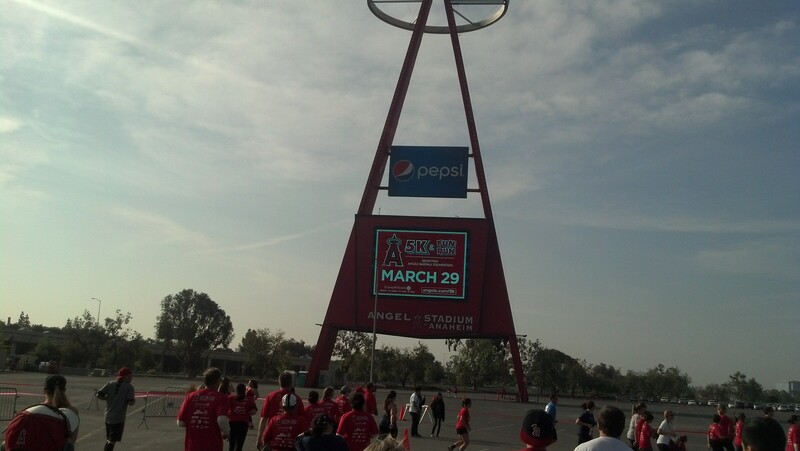 It was still cool to run on the field. 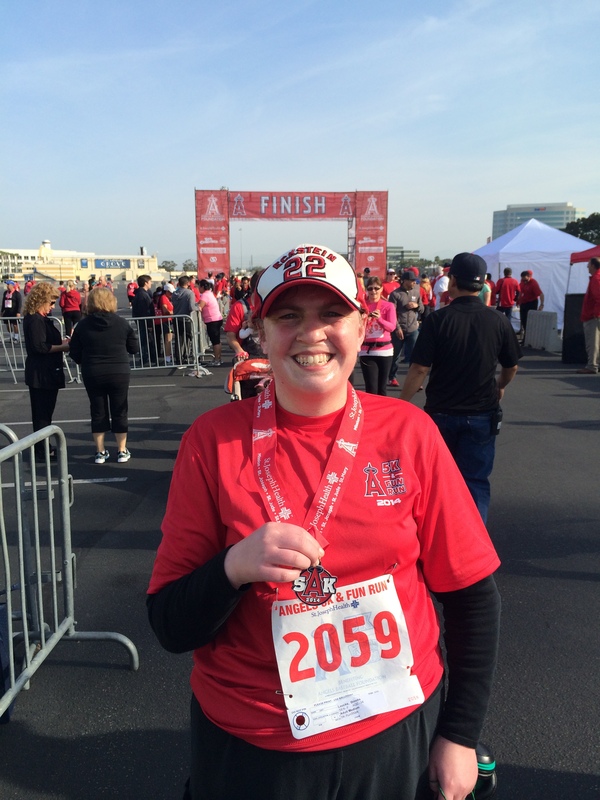 However, it doesn’t give you the same goose bump feeling as the Disneyland Half Marathon gave me. 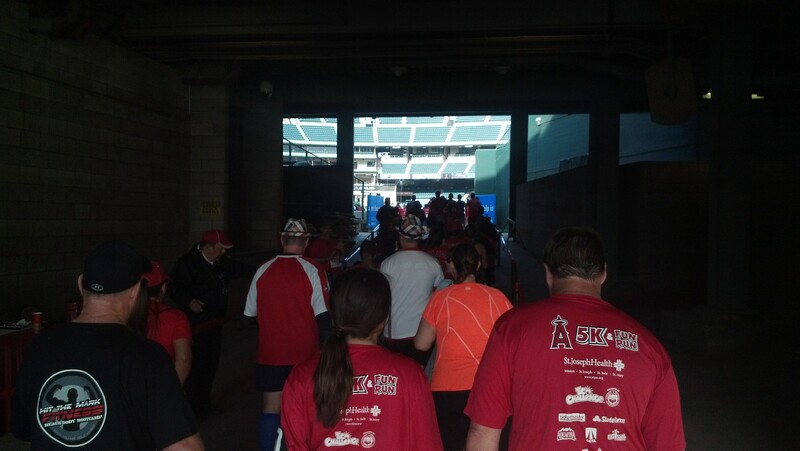 Inside the stadium, we follow the same route as the Disneyland Half Marathon followed. Since we weren’t running this race for time, we had to stop for some fun pics. We made our way very slowly around the field. Brooke wanted a picture with the empty seats in the background. 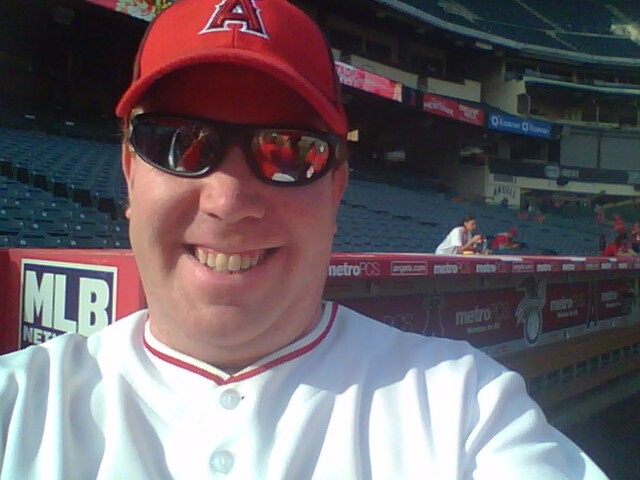 Last year, I got pictures inside the visiting team’s dugout. This year? No dice. They roped off the dugout. I don’t know if they were surprised with how many people went in the dugout last year or if it was because of the earthquake, but they didn’t want anyone in the dugout this year. Oh well. So, we posed outside the dugout. It is still fun even on the outside. 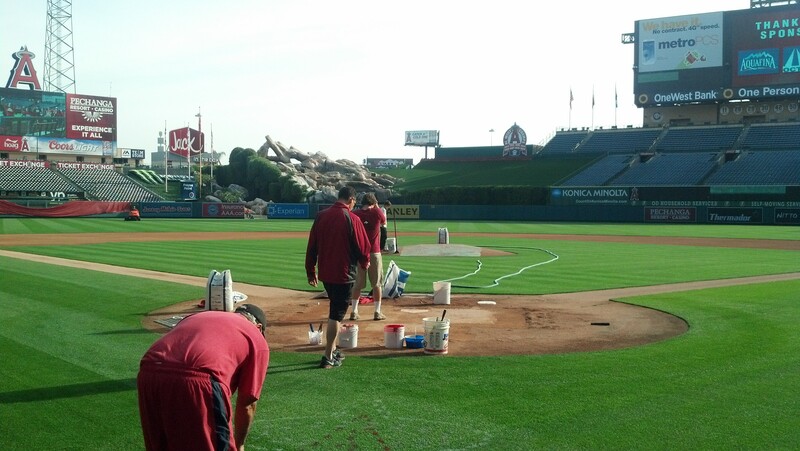 As we made our way towards home place, the grounds crew was getting the field ready for the close of the pre-season freeway series with the Dodgers that night. 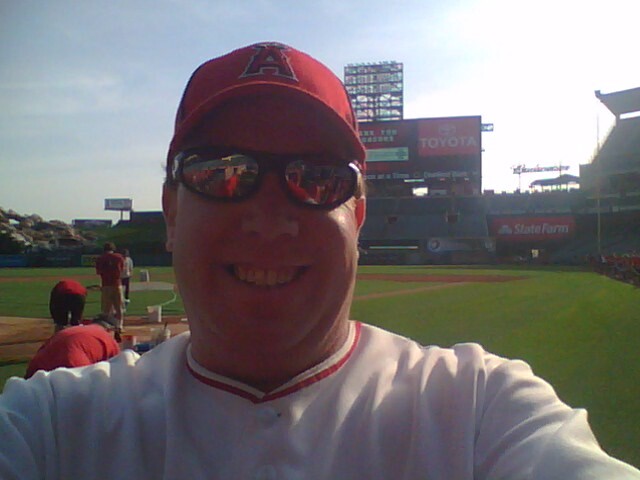 I couldn’t resist stopping for a selfie behind home plate! 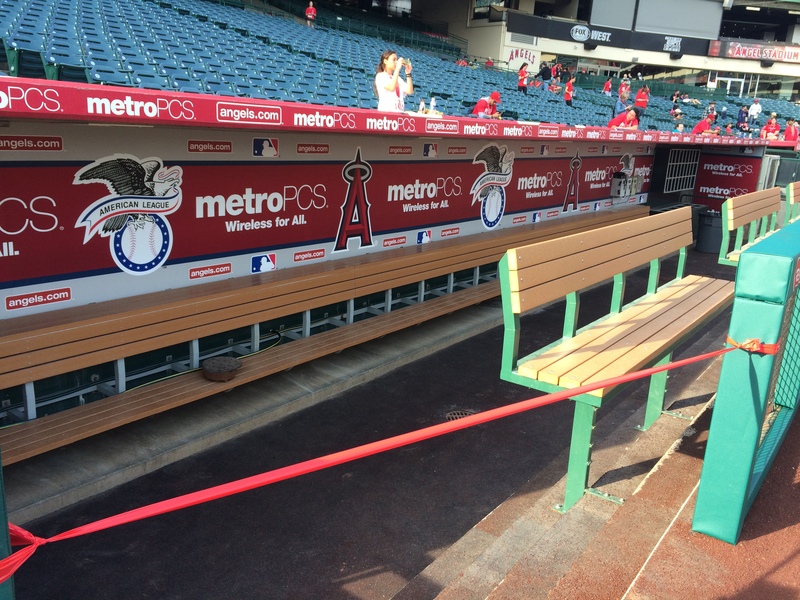 The Angels dugout was also roped off. I still stopped for a quick picture. 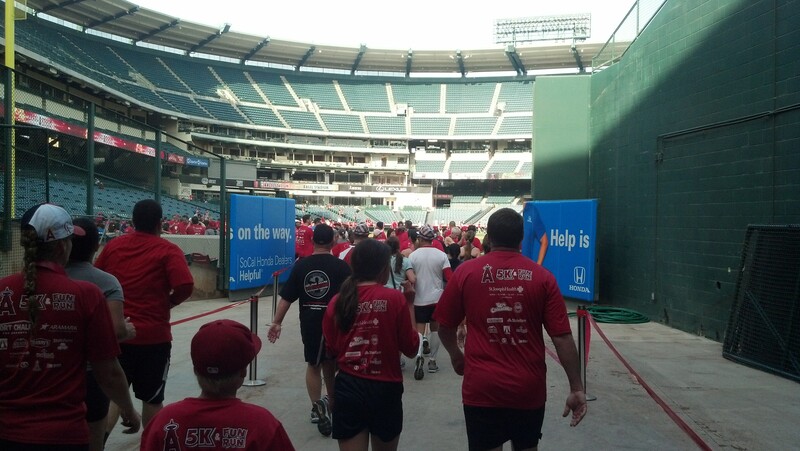 Eventually, it was time to exit the stadium and finish this race up. Going up and out of the stadium was the only “hill” (if you could call it that) on a flat course. Another upgrade this year was the addition of a finishers medal. 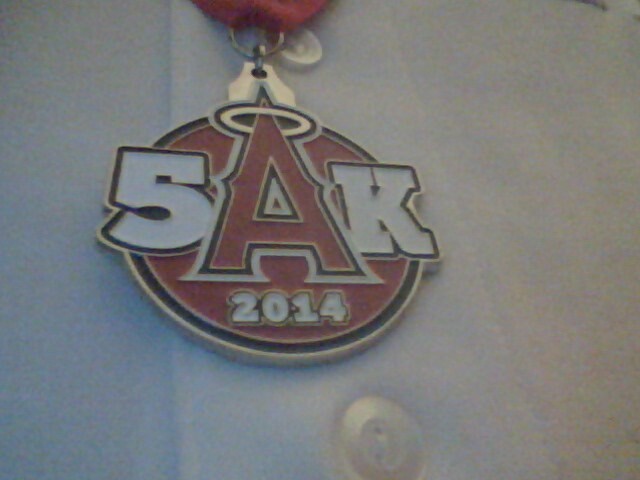 It may seem strange to some, but I’ve run this race twice without ever getting a finishers medal. So, when they first announced a medal, I knew that I had to do this race again. It’s a nice medal. Don’t you think? So, when we stopped for the picture with Mike Trout on the course, Brooke mentioned how she wanted a picture of just her with Trout. However, the line had grown. So, we decided to come back after the race. 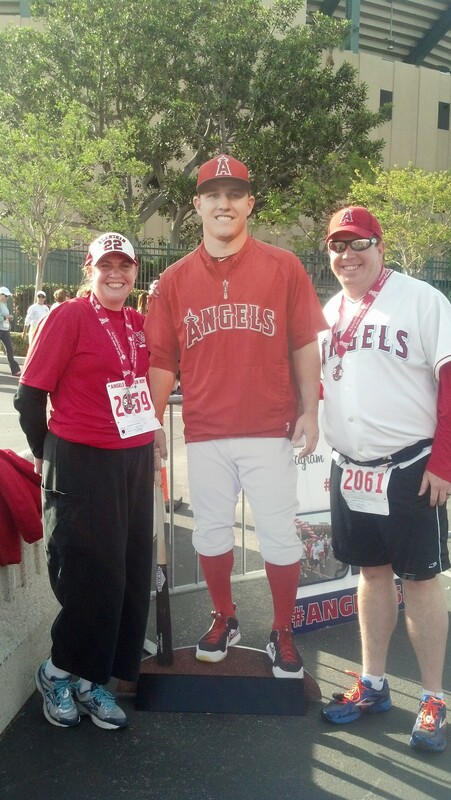 She did get her picture with just her and Mike Trout. 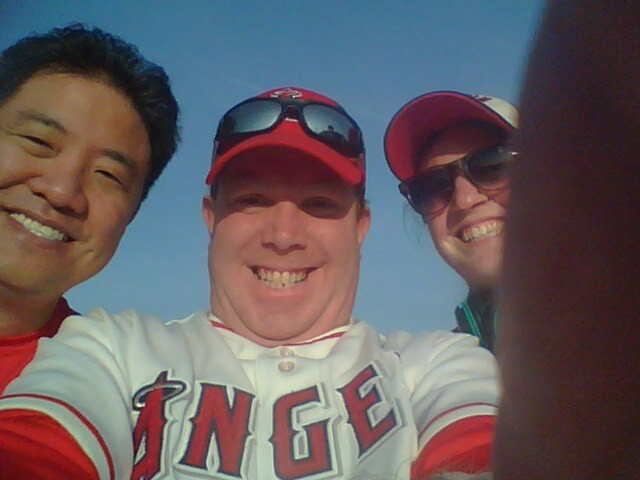 We also got one together with our favorite Angels player! 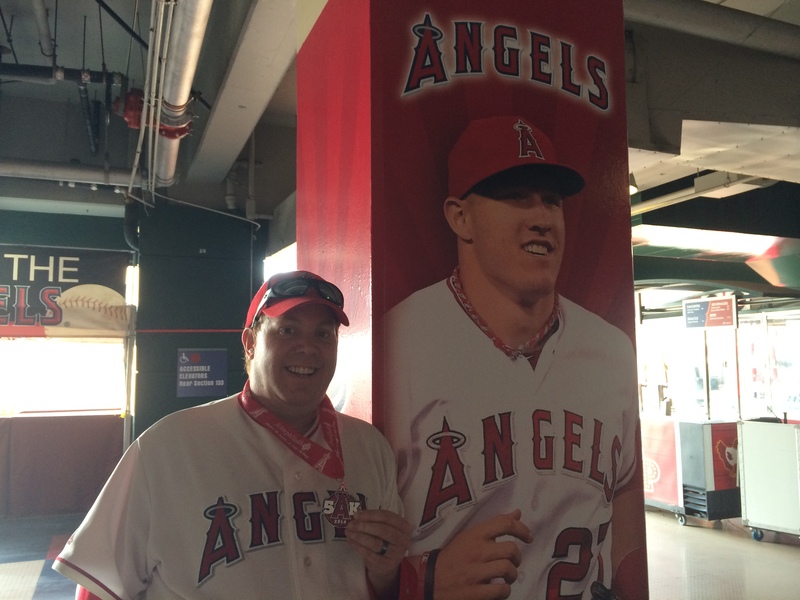 While waiting for Brooke to finish using a real rest room inside the stadium, I couldn’t resist another picture with Trout and my finishers medal. I love the signs they have inside the stadium. So, Brooke and I had some fun with the signs before taking off. When I saw this sign saying “Moment of Victory” I knew a picture must be taken. They came out great. Don’t you think? Hey, you’ve got to have some fun with the races. 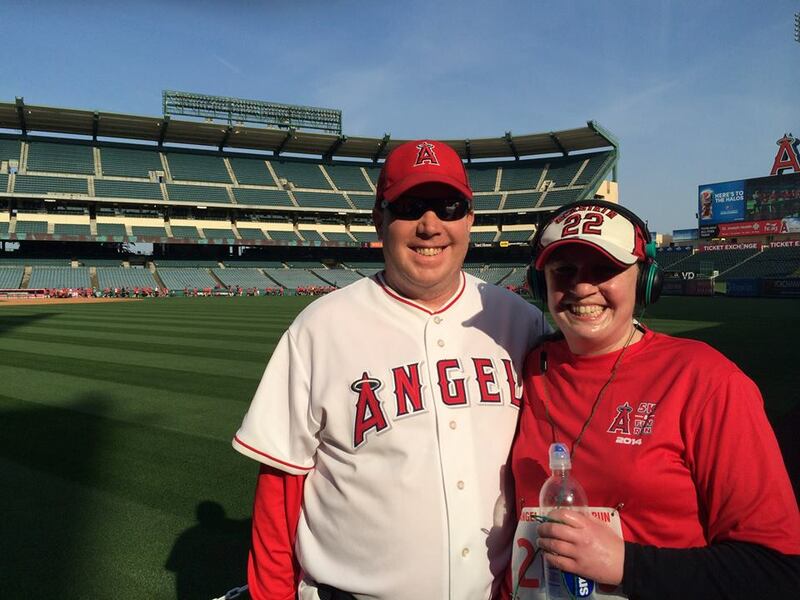 Being Angels fans as Brooke and I are, this race gave us a lot to play around with. I love this race! 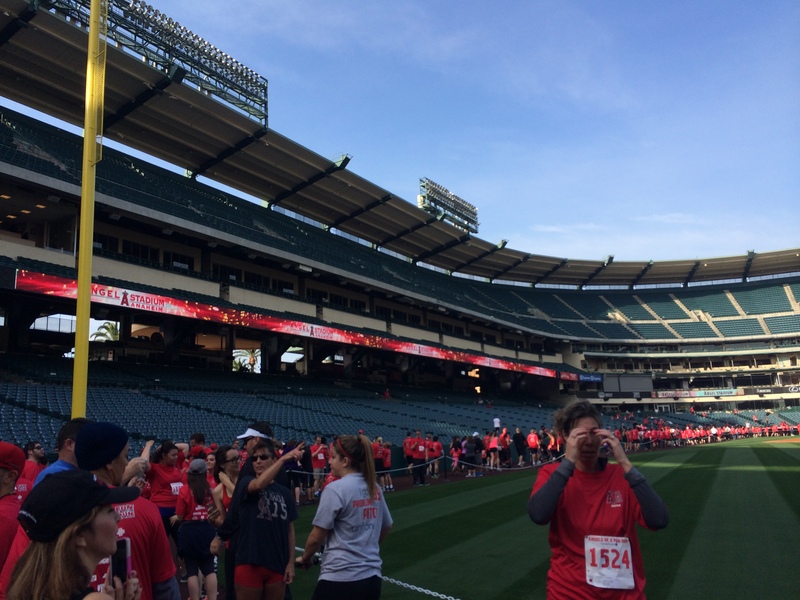 The Angels Baseball Foundation 5K is a real winner for a non runDisney race. This is my third time running in it and it might not be my last. I think they’ve done an amazing job this year with the upgrades. My first two years running, it was cool to run on the field. However, I was kind of over it by the end of the second year. The addition of a finishers medal, the two on course bands, two water stops, and the 4 picture locations have really turned this into one of my favorite races! 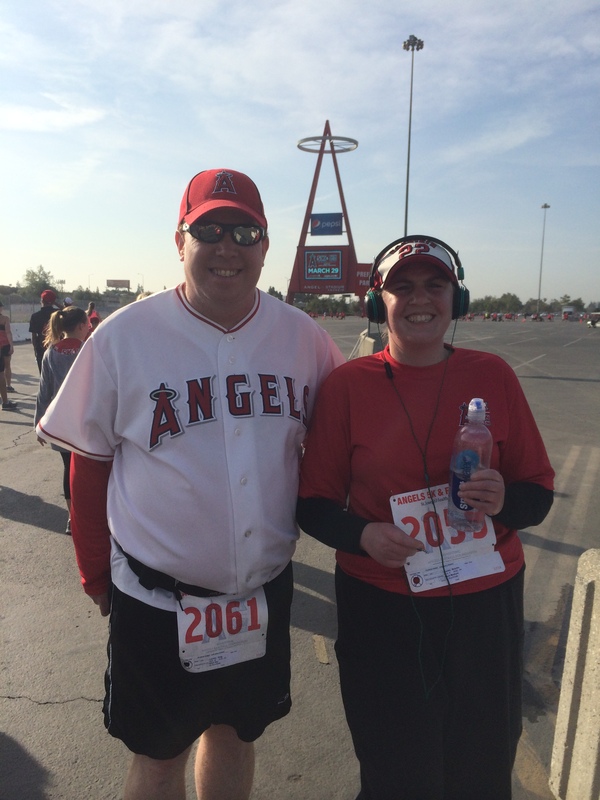 I also loved the new race course because it kept Angels Stadium in view for most of the race. 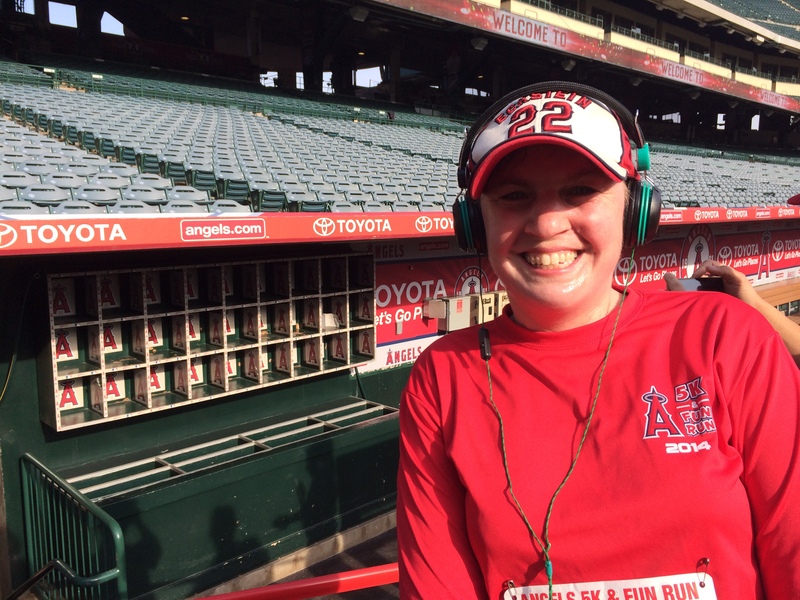 If you live in Southern California and are looking for a fun, sports themed race, I highly recommend the Angels Baseball Foundation 5K. There were lots of families out on the course, people pushing strollers, and even people running with their dogs on the course (always fun to see the doggies dressed in their Angels gear!). It offers a flat, fast course for potential PR’s. But, it also offers fun things that you can just ignore your time and enjoy. 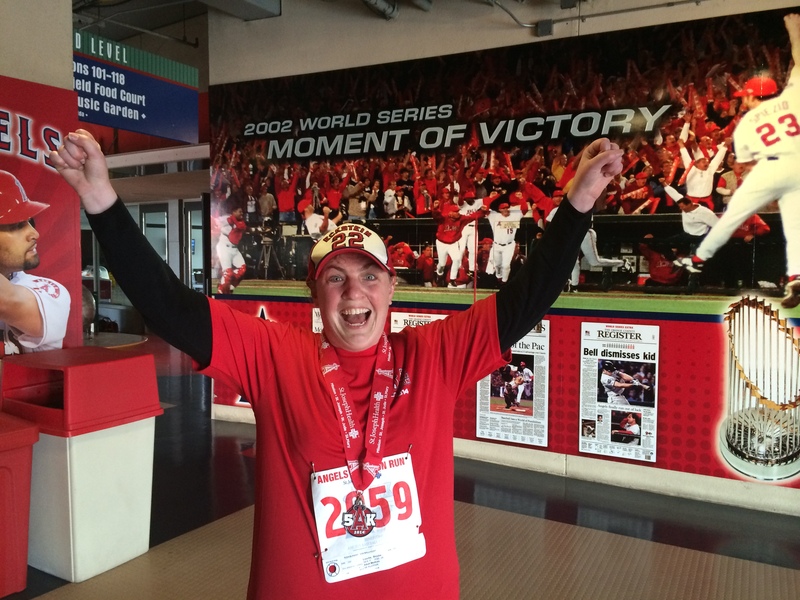 Question of the Day…Do you ever run races just for fun and without any time goals? I’ve heard that the Color Runs are really fun. I haven’t done one myself. Maybe someday. Isn’t it good to just get out with a bunch of people and run for fun? I think so.